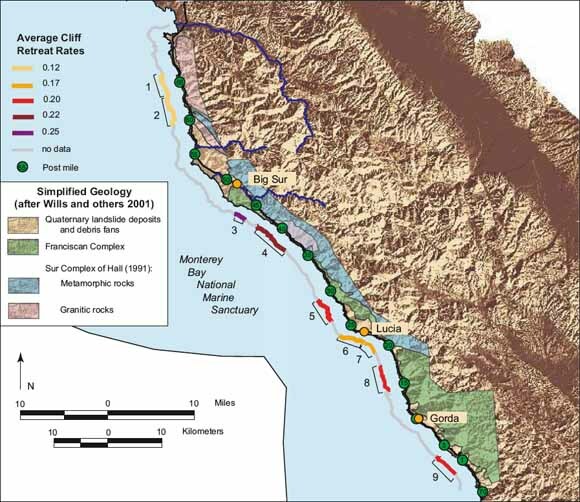 The average coastal cliff retreat rate along the Big Sur coast is 18 ± 6 cm/yr as measured over a 52-year time period. The erosion reference features measured as the cliff edge include the well-defined cliff edges common to marine terraces, slight breaks in the slope defining the upper edge of the active lower slope, and the road grade. Cliff erosion and retreat are focused in isolated erosion hotspots that account for most of the calculated average retreat.